Not our friends or our living room. But note the squished in-ness! Steve and I are starting a faith community here in our living room. We’ll meet for the first time on Sunday, December 29th, at 10:00am. There will be prayer, a sermon, and some time to quiet the chaos of life and listen in to what God might be saying to each of us. Steve and I are starting this because we like being in a community where we help each other figure out what God is saying and doing. It adds to life, shaping the rhythm of your week in a way nothing else does. 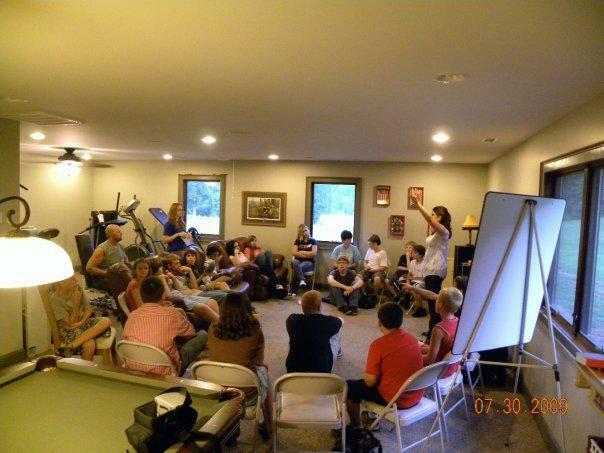 Our approach to faith was formed in this sort of gathering about a decade ago, in what was called a small group – a phrase always spoken with a hint of irony, as those groups rarely stayed small for long, and were comprised of people willing to squish over a bit on the couch or floor to make room for new people each week. We talked and laughed and hoped together, looking at the Bible to help us make sense of it all and figure out how to respond. It was a powerful, transformative thing. Part of what we learned was that when you explore Jesus together, you become a sort of second family. It’s surprising, actually, how people you may not have much in common with outwardly become allies in your life. There’s something about believing together – that that Jesus cares for us, speaks to us, and has a purpose for our lives…and that a primary way we discover what that is and how to pursue it is by squishing together in the living room to talk and learn and pray. It’s kind of miraculous…and also very cool. More than a decade later, we are surprised (and grateful) to realize that these ties are still strong – we are STILL family, still helping and encouraging and being for each other in amazing ways, even though we are all living in different places and attending different churches. The bond still holds. If you live in Greater Boston and are wondering what God might be saying to you, or how to respond to what He is doing in your life, this might be something to check out. Send me an email (TrishRyanOnline AT Gmail dot com) and I’ll give you directions to our house and answer any questions. So that’s the start: On Sunday the 29th, Steve and I (along with THAT DOG) will be in our living room, celebrating God. You’re invited. This entry was posted in Church, Connecting, Faith and tagged Faith Community on December 20, 2013 by Trish Ryan. That’s awesome, Trish! I believe in the power of these “small groups”; and I’d rather attend one of them than regular “church” any day. I pray many are blessed through your ministry.